Gary C. Durell aka Gary Durell's parents were Quentin L. Durell aka Quentin Durell (1919-2015) and Ellen L. Durell aka Ellen Durell née McGowan (1926-2011), both born, raised and died in Alliance, Stark County, Ohio. He had two brothers, both deceased: Robert Durell (?-? ), David Durell (?-?). 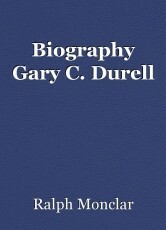 Durell's (288-48-6918) prior service included US Air Force Security Service (USAFSS) SIGINT in Texas and Italy. He joined NSA in 1977 and worked at Chicksands RAF Base (7.7 miles southeast of Bedford, Bedfordshire; 11.6 miles northeast of Luton, Bedfordshire; closed 1997) until 1985. Training followed at Warrenton Training Center (WTC) Bear Wallow Road, Warrenton, Virginia 20186 and The Foreign Service Institute (FSI), Rosslyn, Virginia 22209. In 1987 he joined the Special Collection Service (SCS). Durell's last address before PCS to US Consulate Karachi was the Wedgewood Forest subdivision, Severn, Maryland 21144 which he left in November 1994. His three prior posts were Djibouti, US Embassy Bangkok, Thailand, and US Consulate Bombay/Mumbai, India. Wednesday 8 March 1995 0750 PST (Pakistan Standard Time: UTC = 5 hours) Shahrah-i-Faisal Highway aka Shara-e-Faisal Boulevard ???? ???? third traffic light near a row of shops called White House Plaza P.E.C.H.S. (Pakistan Employees Cooperative Housing Society ?? ?? ?? ??? ????) a white Toyota minibus with tags CC-64-126 (clearly identifiable as diplomatic because of the number "64" on the license plate) driver was Nasim ul-Haq aka Naseemul Haq. Stolen yellow Suzuki Khyber taxi tags PG-1326 overtook the minivan and blocked it while a red car blocked it from the other side. Two assassins with Chinese 7.62mm AK-47. A USAF C-141 plane carried the coffin to Andrews Air Force Base after refueling at Frankfurt. Strobe Talbott (1946-), Anthony Lake (1939-), Pakistani Ambassador Dr. Malehi Lodhi Ph.D. aka Dr. Maleeha Lodhi Ph.D. ????? ????? and about 200 USG employees met the plane. Mark Andrew McCloy aka Mark McCloy (1964-) born Framingham, Massachusetts, Deana Lee McCloy née Webb, their children Patricia McCloy (1991-) and Shawn Michael McCloy (1994-) of Vienna, Virginia, Wanna Chettee Durell aka Vanna Durell (Thailand May 1960-), 975 Stratford Place, Alliance, Ohio 44601-3691 were among those aboard. Jacqueline Elaine Keys Van Landingham (1962-1995), Economics Section secretary, born Camden, South Carolina died at Aga Khan University Hospital, Stadium Road, Karachi 74800, Pakistan.